W hat exactly is meant by the term "pay to play" and why do we at Zoomba Group avoid it? "Pay to play" is one of those phrases that is often uttered with a knowing nod be- tween speaker and listener. The truth is that, depending on the speci•c context, it can have a wide range of different meanings based on precisely what is being discussed. It can be something innocuous, like baking extra cookies for a school bake sale to curry favor with a teacher. Or, it can be something as serious as paying money under the table to sway a government contract. Everything is •ne until the bridge collapses. I can tell you what it means in B2B publishing. From the publisher's perspective, it can generally be de•ned as accepting mon- ey from an advertiser to present information about a product, person or company, as if it is true and editorially signi•cant or relevant, without being clearly identi•ed as a paid ad or sponsored content. It is the reason why we have a •rewall inside Zoomba Group that separates sales and editorial. We take that division very seriously because we take our editorial integrity very seriously. As a reader, you can know with absolute assurance that no one is ever receiving an award or recognition from FE&S, for ex- ample, because money has changed hands. 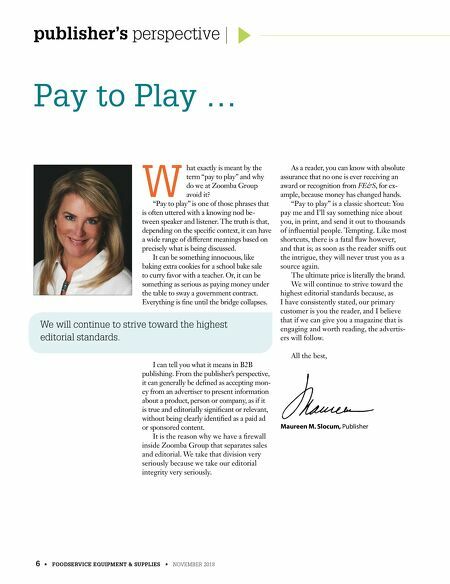 "Pay to play" is a classic shortcut: You pay me and I'll say something nice about you, in print, and send it out to thousands of inˆuential people. Tempting. Like most shortcuts, there is a fatal ˆaw however, and that is; as soon as the reader sniffs out the intrigue, they will never trust you as a source again. The ultimate price is literally the brand. We will continue to strive toward the highest editorial standards because, as I have consistently stated, our primary customer is you the reader, and I believe that if we can give you a magazine that is engaging and worth reading, the advertis- ers will follow. 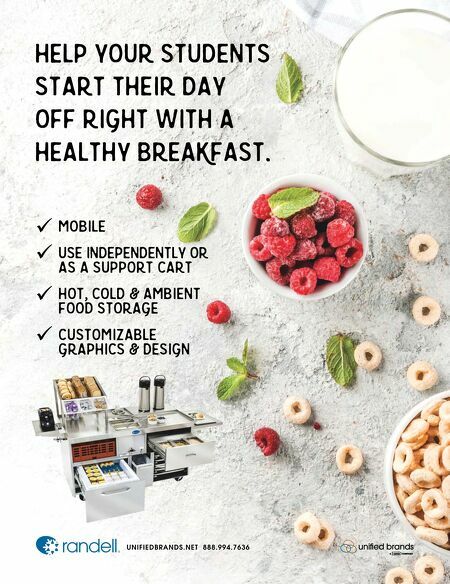 All the best, 6 • FOODSERVICE EQUIPMENT & SUPPLIES • NOVEMBER 2018 publisher's perspective Pay to Play … Maureen M. Slocum, Publisher We will continue to strive toward the highest editorial standards.